Even in Arizona it’s winter now, and our Airstream is mostly dormant. Although we boast of having a 365-day camping season, in practice we do relatively little camping in the winter because the Sonoran desert is chilly at night, and the nights are long. We have to plan our days carefully because around 5 pm the dark comes crashing down and the temperatures plummet. You want to be back at camp, all set up and cozy when dusk arrives. There’s not much natural entertainment after dark except for the songs of the coyotes. 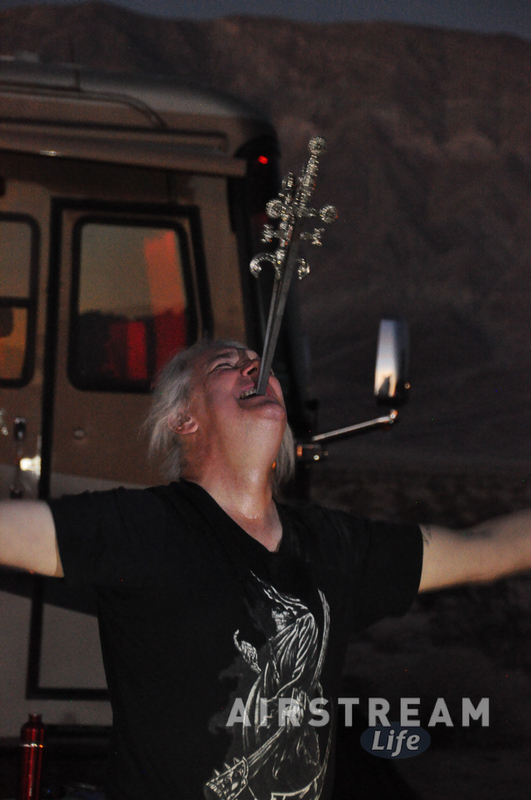 It can, however, be quite interesting to make your own fun on those long dark nights in the desert. I’ll let you in on a “full timer” secret: The best camping this time of year isn’t in Arizona, it’s in California, particularly near the coast where the temperature swings are more moderate. Last January we took full advantage of that with a two week trip to Death Valley and the coast up to San Francisco. Even with frequent El Niño rains around the Bay Area it was a great time. If you follow the blogs of various full-time RVers you have probably noticed that they tend to congregate over the winter in a few areas. Most full-timers hate freezing nights—the propane really disappears fast when overnight lows are below freezing—and so unless they have an obligation to be somewhere, Airstreamers head for a few reliably warm spots in the continental US. Basically that’s southern Florida (below I-4), southern Texas, southern Arizona, southern California, the Pacific coast, and a few warm national park sites like Death Valley, Big Bend, and Padre Island. This year we skipped our usual post-Christmas or early January trip to California, the first time we’ve done that in a decade or so. Instead, we will take a trip in mid-March. 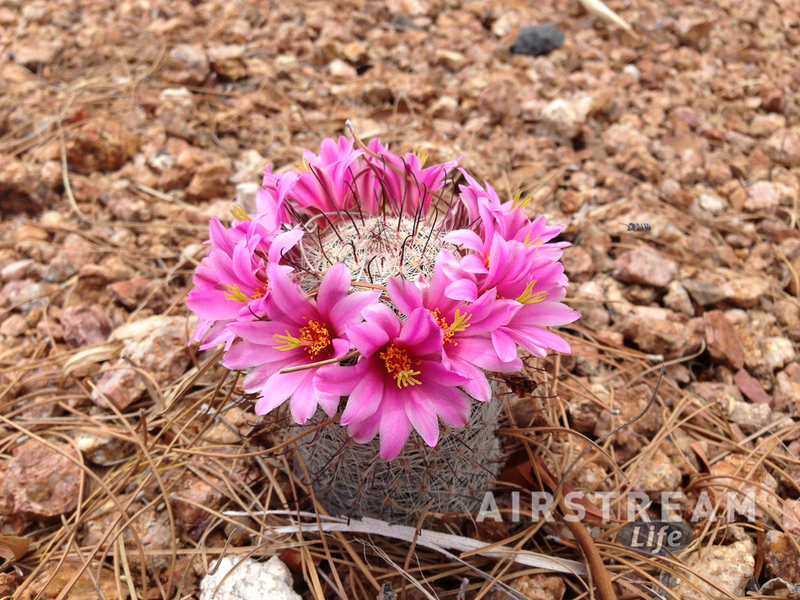 March is an especially nice month to visit the low desert (anywhere from Texas to California) because it’s springtime and the desert plants will be blooming. Last year the media and the parks were talking up something called the “Superbloom” and that might lead you to think that other desert springtimes are not worth the trip, but you’d be missing out. Every spring in the desert is wonderful. 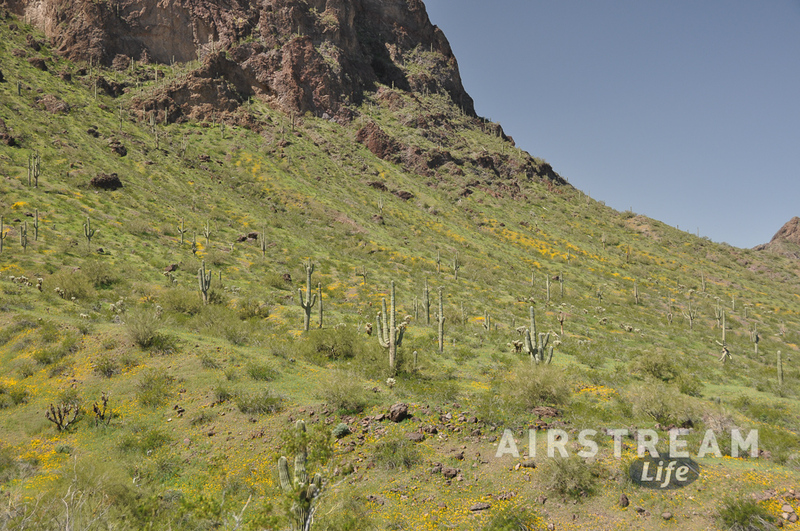 The weather is nearly perfect: sunny, warm but rarely hot, and even if the blooms are below average you will still see lots of tiny flowers and green cacti if you just take some time to go for a short hike. When it’s not out traveling our Airstream is fortunate to have a cozy carport to snooze in, protected from the slow degradation of weather and kept happy with a 30-amp power hookup. We keep it warm and mostly packed so that we can host occasional overnight guests or hitch up for an impromptu trip if some inspiration should overwhelm us. a tarp will trap moisture rising up from ground and inhibit the Airstream from being able to dry out naturally, which can actually cause more moisture-related problems than it prevents! Any sort of structure that keeps the rain, snow, and sunshine off your Airstream will help preserve it over the winter. If you use a storage facility, opt for a covered space—it’s worth the premium! But try to avoid enclosed barns and tents that have earth floors, unless there’s a vapor barrier in the ground. Any corrosive material or damage to the clearcoat will be encouraged to become blooms of white spidery filiform corrosion during winter storage in a humid environment. Ideally your Airstream should be stored below 60% relative humidity, although obviously that’s not always possible. Given a choice between a humid indoor environment, and a cold winter outdoors with some snow, I’d make sure the roof was leak-free and store it in the snow. The dry winter air is far better than a damp and somewhat warmer environment. My other piece of advice is to consider taking a long trip to a warmer climate if you can. Lots of Airstreamers take their rig south during the winter, then store it in a covered spot for a return trip later in the season. Seems like a great idea to me: essentially your Airstream becomes a moveable vacation condo! Whatever you do, stay warm and plan ahead. Even if you can’t get away over the winter a long lovely season for camping is not far away. While your Airstream dreams in its winter bed, you can dream of travel and camping yet to come.